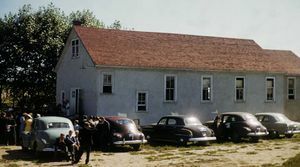 Linden Mennonite Brethren Church, 1950. The congregation began services in 1929, and formally organized in 1933. The first building was occupied in 1933, with a subsequent building program in 1963. N. A. Rempel is considered the founding leader of the group. The congregation originated through immigration from the Soviet Union. The language of worship is English; the transition from German occurred in the 1950s. Prior to 1947 the group was affiliated with the Evangelical Mennonite Brethren. It was then known as Swalwell or Linden Evangelical Mennonite Brethren. The original composition of the group was Church of God in Christ, Mennonite, Evangelical Mennonite Brethren, Mennonite Brethren, General Conference Mennonite and Allianz Mennonite all of whom settled in the area from the United States, Manitoba and Russia. The congregation was influenced to join the Evangelical Mennonite Brethren conference by various evangelists visiting the community. 50 Years, 1929-1979: Mennonite Brethren Church Linden. 1979, 23 pp. Megli, Sam. "Historical Review of the Mennonite Brethren Church of Linden, Alberta." Unpublished typescript, 1979, 9 pp. Mennonite Historical Society of Canada collection, Mennonite Archives of Ontario. Mennonite Brethren Herald (27 May 1988): 7; (21 February 1992): 14. Centre for Mennonite Brethren Studies, Winnipeg, Manitoba. Volume 337, 338, 424. Microfilm: R52, pp. 1508–2367, R53, pp. 1–310. Toews, A. A. and Marlene Epp. "Linden Mennonite Brethren Church (Linden, Alberta, Canada)." Global Anabaptist Mennonite Encyclopedia Online. March 2012. Web. 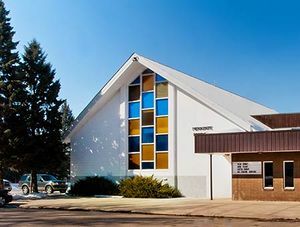 20 Apr 2019. http://gameo.org/index.php?title=Linden_Mennonite_Brethren_Church_(Linden,_Alberta,_Canada)&oldid=163449. Toews, A. A. and Marlene Epp. (March 2012). Linden Mennonite Brethren Church (Linden, Alberta, Canada). Global Anabaptist Mennonite Encyclopedia Online. Retrieved 20 April 2019, from http://gameo.org/index.php?title=Linden_Mennonite_Brethren_Church_(Linden,_Alberta,_Canada)&oldid=163449. Adapted by permission of Herald Press, Harrisonburg, Virginia, from Mennonite Encyclopedia, Vol. 3, p. 350. All rights reserved. This page was last modified on 9 March 2019, at 03:25.